The yen to dollar currency pair continued to trade sideways yesterday in a very narrow trading range as we approach the end of the Japanese accounting period on March 31st , with the forex pair range-bound between 90 and 91 as a result. As always with any period of consolidation, this is generally followed by a sharp breakout which we can expect to see once the year end has passed, and the question of course is whether this will be to the upside or the downside! The only technical clues we have at present are those provided by the 200 day moving average, which to date have proved to be a significant barrier to any potential test higher, as we saw in early January and again in mid-February, with the shorter term moving averages providing little in the way of guidance due to their tight bunching in the 90 price region. Any move to the downside will of course be countered by the Bank of Japan, who will intervene should begin to approach the 85 price handle, last seen in December 2009. Short term trading in the dollar yen is very risky at the moment, and the better bet is to wait for longer term trading opportunities which should have a better chance of success, once the current sideways consolidation has broken down, and we have a new price trend to trade. 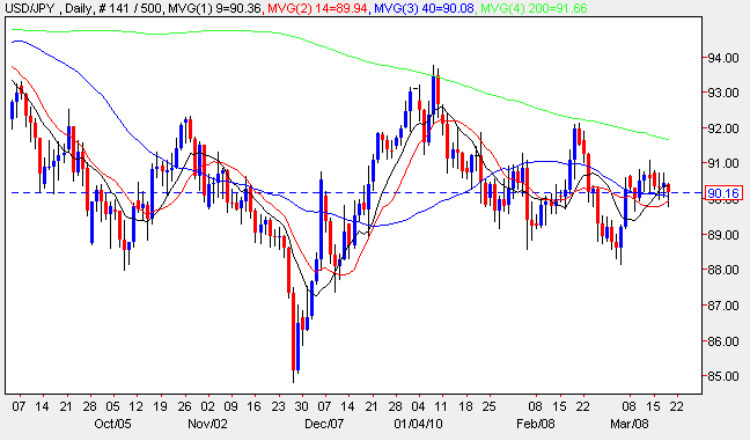 The key will be the 200 day moving average above, and only a break and hold above both this, and the 93.50 price area will indicate a strong move to the upside, while any break below 88.50 will indicate a further test lower, which will of course be supported by the BOJ in due course, forcing the currency higher as a result.